Photo of Onobrychis viciifolia Scop. Perennial herb of the Pea family -papilionaceae-up to 80 cm. Stems generally erect, rarely postrate. Compound leaves, pinnate with till 14 couples of leaflets. White flowers with rosy veins. Teeth of the calyx longer than the tube with visible hairs. The fruit is a pod, with well defined teeth at the margin. 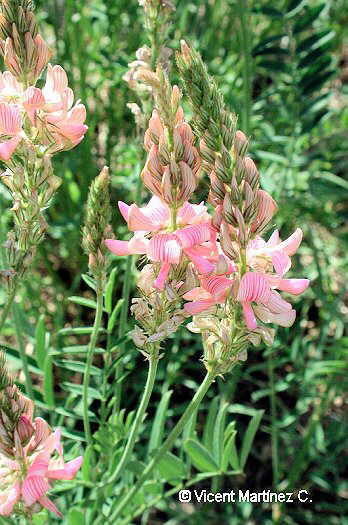 Plant cultivated as fodder, sometimes naturalized in dry calcareous grasslands.